You have seen the rest of my holiday house, did you really think I kept my Christmas photos in a boring old photo album. Come on, you know me better than that. 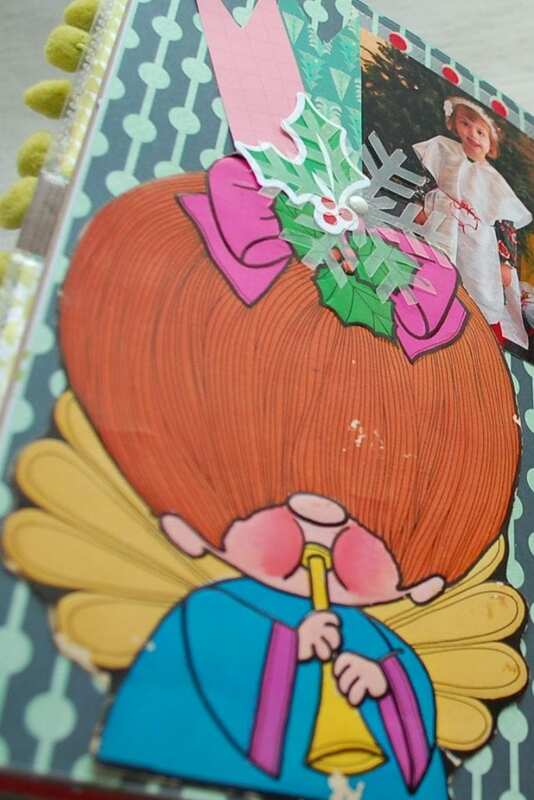 Once upon a time I had a really hot and heavy relationship with scrapbooking. I prefer to call them Smashbooks or Junk Journaling. No matter what you call it, they hold my Christmas pictures and a lot more. 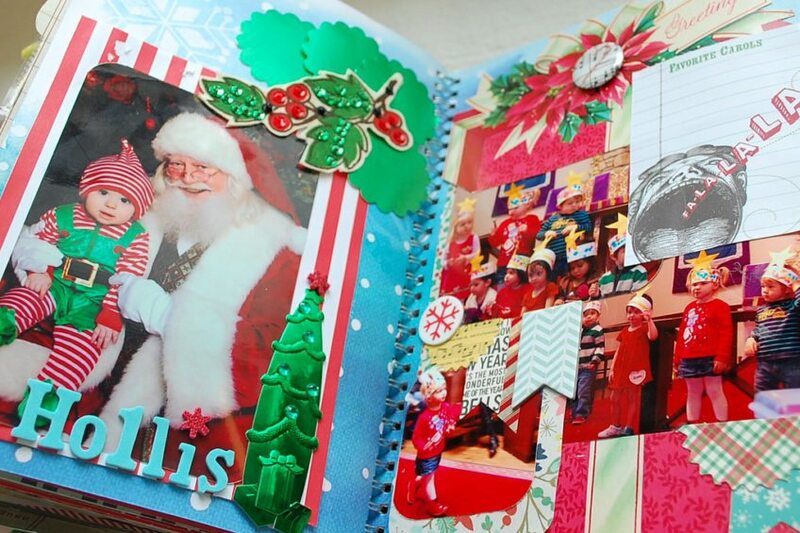 Scrapbooks are so much more fun and visually appealing to me than the flat stagnate images in a photo album. Sure it’s a lot easier to slip photos into pockets, but gluing stuff to stuff is so much more fun. Even my version of Project Life and Pocket Pages are puffy, just check out my Halloween Scrapbook. Like most things holiday I collect vintage ephemera to include in my scrapbooks. Old cards like this one make great additions. Check out my Naughty Secretary Club Etsy Store for some my Collage Curios Packs. 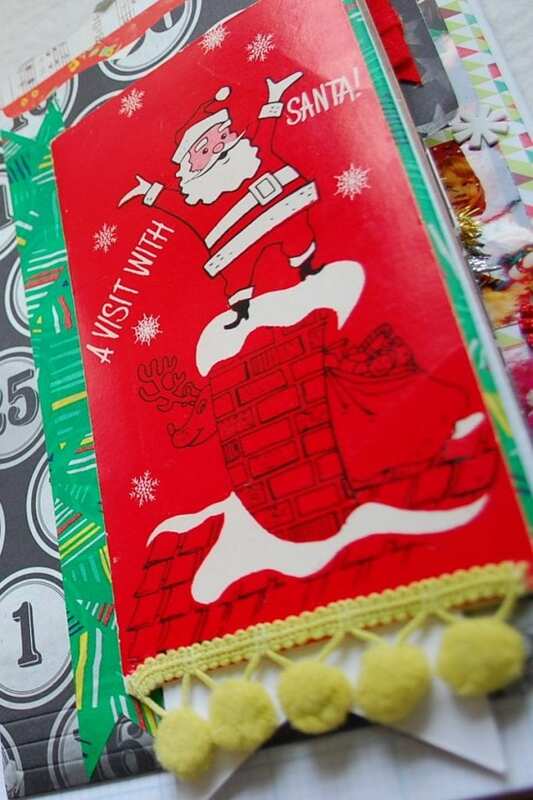 Those babies always have great things for scrapping, smashing, journaling and more. I love pictures. The more the better. I have photo albums, picture frames, digital picture frames even the screen savers on my smart TV’s are more pictures. Can you really ever get sick of looking at the faces of your kids? I must have taken 200 pictures this day just to get the one I finally used for our holiday card. This layout is a collage of the adorable out takes. 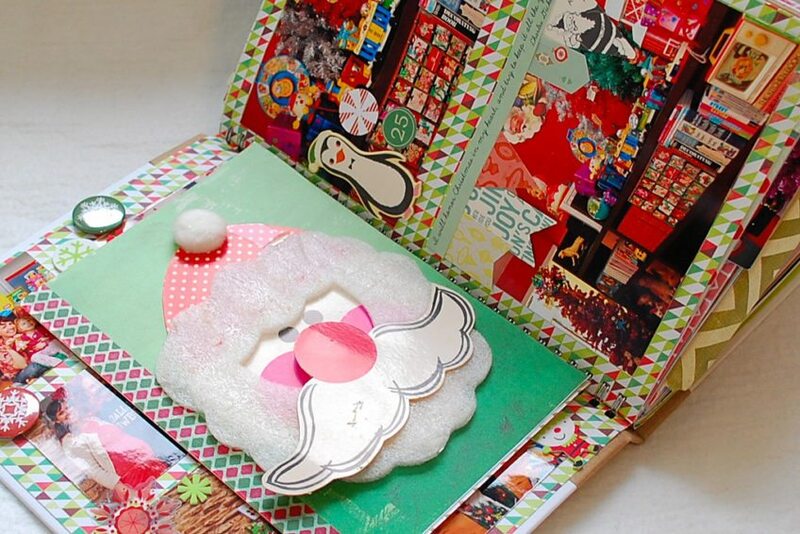 I’m not afraid of bulky scrapbooks that barely close, in fact I embrace it. Bring on the pompom fringe! Check out my post on Using Fabric in Your Junk Journal (sewing trim too!). 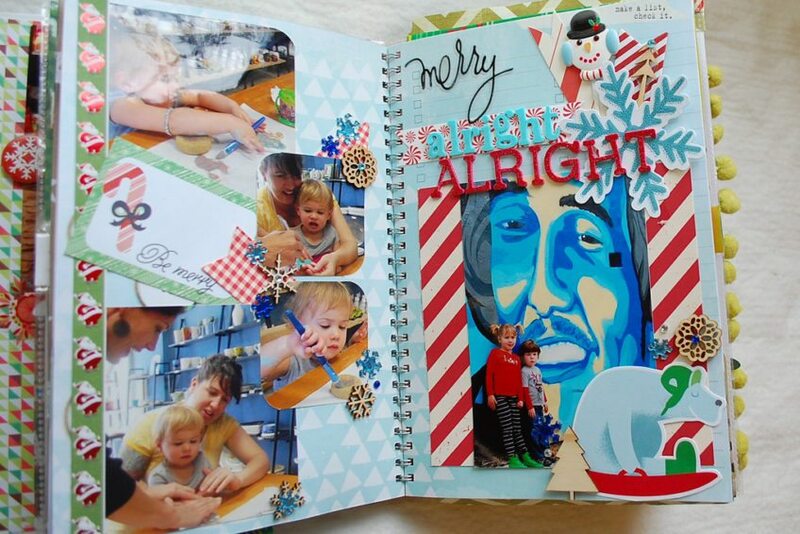 I loved using a Smashbook for this addition of December Daily, but there are plenty of other options out there. 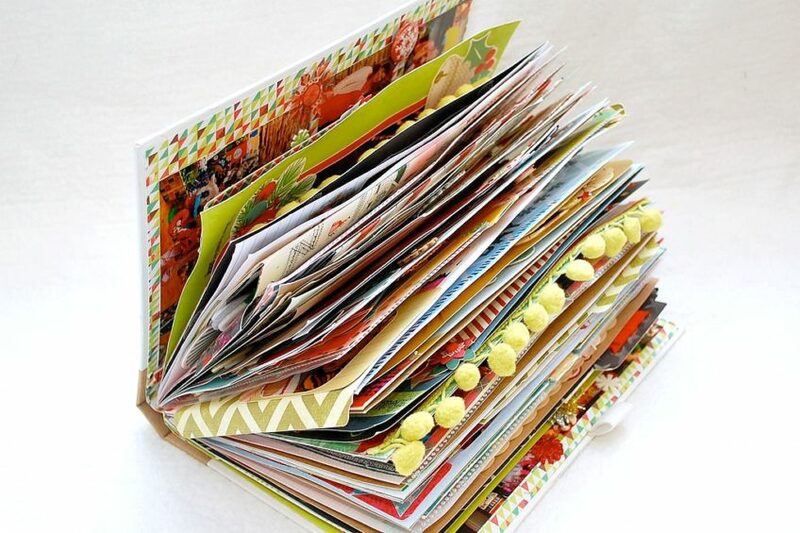 You could use pocket pages or even make your own Junk Journal out of an old book like I did for DIY Network. So just because my holiday photo album looks as over the top and kitschy as the rest of my house does not mean yours has to. 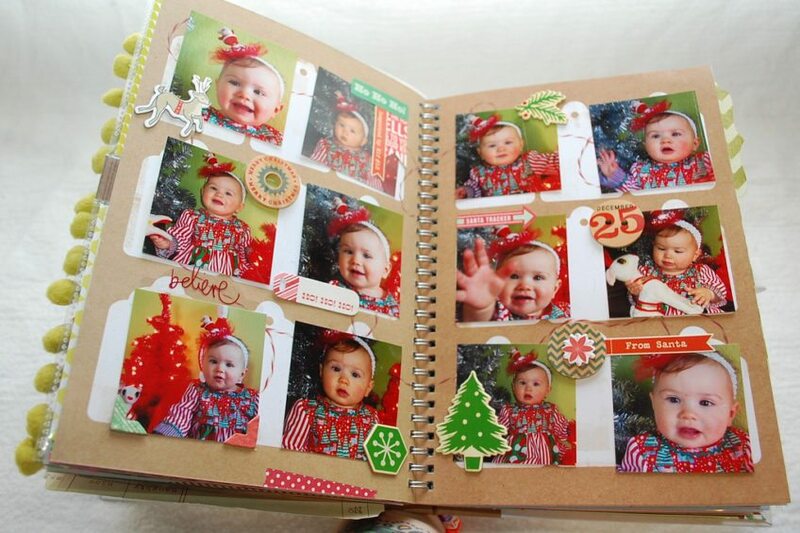 Just be sure to take lot’s of holiday pictures this year, be sure to actually print them out and then spend a snowy day inside getting to know your glue stick. Posted December 11, 2016 & filed under Christmas, Crafts, Holidays, Paper Crafts, Recycled Crafts. I love these! Any recommendations for books to use?